The first and the largest Alternative to the eBay Search Engine offers unique way of browsing through the millions of eBay items. Mosaic is now complete in 30% with over 250 micro-ads it looks really nice. It has been already named by many the best successor of the Million Dollar Homepage by Alex Tew. The first eBay Alternative to the Search Engine offers unique way of browsing through the vast network of millions of eBay items. http://www.eBayPixels.com (know also as http://www.AuctionPixles.co.uk) is one of the very few pixel pages with a high PageRank, over 200 pages listed within search engines and loads of targeted and interested visitors coming to the website daily. The fortnightly contests held in a form of the Treasure Hunt keeps visitors curious and willing to explore the items of featured sellers. With a small exception of hotel auctions from the travel partner – http://www.RoomAuction.com and a few other great pixel pages, eBay Pixels promotes only Good eBay Sellers. To be listed on the website you have to be an eBay seller with a minimum of 98% feedback score and minimum 25 comments, however vast majority of our sellers has hundreds of positive comments. In this way eBay Pixels promotes the hard work and the commitment trying to support best eBay sellers. Advertising costs 10 GBP (pounds sterling) per box and lasts for minimum 5 years. This makes it an equivalent of eBay Featured Plus upgrade offered to promote a single item for maximum of 10 days. Most visitors into the website come from UK and USA. Being so much targeted eBayPixels is the only pixel page where people come to find things, not just to look at the mostly empty grids of gray pixel boxes. Even sites full of various links would never be as effective as targeted approach. 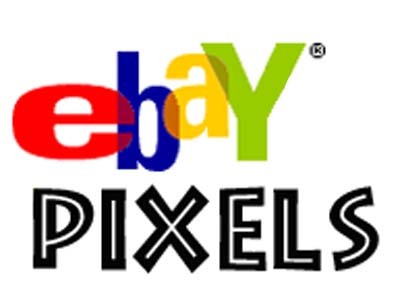 400x300 eBayPixels LogoLogo of eBayPixels available also in other sizes, please contact us for variations. eBayPixels animated banner468x60 banner with the selection of ads. Great fun and great CTR in that one!